"This three-layer apple pie is a Southern favorite!" Place 1/2 cup butter into a heavy cast iron skillet, and melt butter in the oven. Remove skillet and sprinkle with brown sugar; return to oven to heat while you prepare the apples. Remove skillet, and place 1 refrigerated pie crust on top of the brown sugar. Top the pie crust with half the sliced apples. 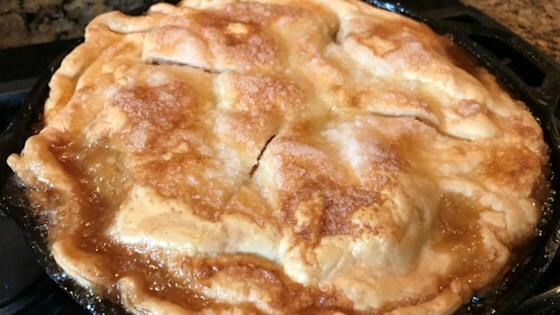 Sprinkle apples with 1/2 cup of sugar and 1 teaspoon of cinnamon; place a second pie crust over the apples; top the second crust with the remaining apples, and sprinkle with 1/2 cup sugar and 1 teaspoon cinnamon. Top with the third crust; sprinkle the top crust with 1/4 cup sugar, and dot with 1 tablespoon of butter. Cut 4 slits into the top crust for steam. Bake in the preheated oven until the apples are tender and the crust is golden brown, about 45 minutes. Serve warm. Three layers of apple pie goodness in cast iron!